This is one beautiful looking ring! This band is available in Rose Gold, 14K Gold, Silver or Black and available in widths of 6mm or 8mm. The metal is milled with a wedding band style for comfort on the strongest steel made. Tungsten Steel is stronger and has a heavier feel than Titanium. The band is toped off with real carbon fiber giving it a strong mans appeal. Ideal to wear fashionably or for everyday use particularly and resists acid-rain, saltwater at the beach, natural body acid and sweat. It's not hard to accidentally bang your ring up against things especially while you are at work, but you'll find wearing Tungsten carbide one of the MOST DURABLE metals in the world. Tungsten carbide promise rings are a REVOLUTIONARY BREAKTHROUGH in jewelry technology. It is DENT and SCRATCH RESISTANT. This metal is very heavy also so you will like wearing a solid and virtually EVERLASTING metal. 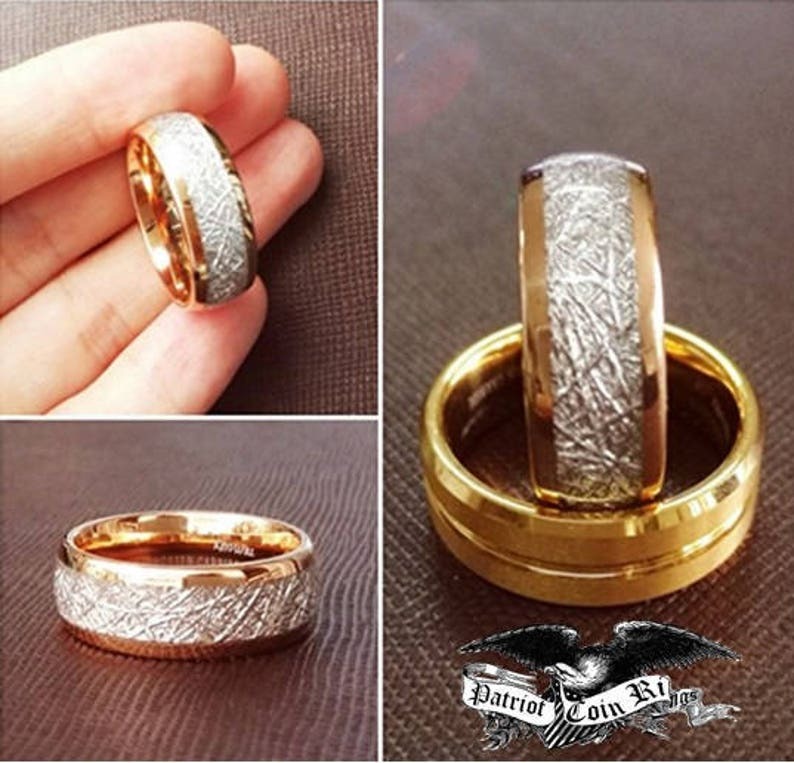 Tungsten carbide ring is the most wear resistant ring in the world. Tungsten carbide is 10 times as hard as 18Kt gold, 5 times as hard as steel, and 4 times as hard as titanium. Tungsten carbide is between 8 and 9 points on the most hardness scale, with a diamond being 10. OVERSTOCK (limited sizes at this price) 8mm Rose Gold Tungsten Carbide Ring Vintage Meteorite Style (1 at this price) Same Day Shipping! My fiance love the ring that I bought him and it fits him very well. Also, this store is really nice. They sent me messages telling me the shipping and the delivery of my ring so I could be aware of it. And is cool how buying in this store helps the veterans. It was better than expected. My husband lives it! Well worth the purchase!